A cemetery is any place with graves, tombs and memorials. The range of types and appearances is vast, from extensive mausolea with huge architectural elabrations, to unmarked plots of ground with hardly a sign it is a resting place. In some cases royal memorials and tombs may be the central point of vast grounds that might not always be known as a cemetery as such. Such sites are extensively visited for a wide range of reasons, depending on the local or national culture, they might be pilgrimage sites as well. Some countries have extensive pilgrimage systems. Cemeteries and the tombs of special people within a religious or national context are connected with others. Sometimes the networks are well mapped and signed, others more mysterious and less obvious. To complicate the issue, some areas and places have very different ideas about pilgrimage, and deny the veracity of the process. People can be told 'no there is no special grave here', or even directed to not consider graves or tombs to be suitable to visit at all. The important part of becoming involved in pilgrimage is to research first. To make sure the cemetery or tomb is an acceptable place to visit and that there are no prohibitions. Some grave complexes have elaborate procedures for visitors to comply with, with restrictions on visiting times, and clothing. In some countries, where heirarchical social and political strictures exist, some graves can even be off limits, or distanced from public access. Some cemeteries in built up areas have massive walls and fences for protection from vandalism. The walls and the surrounding structures can say more about the history of the location than the actual tombs. In earlier times the walls and structures surrounding may have been built in relation to beliefs about things leaving the cemetery, as much as entering. The leave-no-trace principle is the same as for archaeological sites. The legal consequences for trespassing in restricted areas, damaging graves, or souveniring artifacts from graves, might be harsh. Respect the laws and regulations of local authorities. Some cultures have very distinct beliefs about how or how not to visit graves, and it is well worth checking out acceptable practices. For instance some places have strict rules on not walking over or touching a grave or its coverings. Some places also have specified clothing types for people entering, in most cases pieces of clothing are available to hire at entries, or items considered not suitable can be kept at the entrances. Some cemeteries have custodians or caretakers who have information about the place or know where information can be found. Some cemeteries have museums, organised tours and guidebooks for tourists to find the graves of famous and significant people. Many older cemeteries and grave sites that are archaeological sites as well. Due to the pressures of genealogical enthusiasms some cemeteries are able to provide burial lists and details. However, weathering of gravestones or headstones can wash away all information, and for some places, the site is so old, there are simply no people or publications available about the deceased buried there. There are limited ranges of cemetery souvenirs: usually guide books. Some cemeteries have meticulous and elaborate guides. Cahokia Mounds State Historic Site. Saint Louis Cemetery in New Orleans/Tremé, three cemeteries with 18th and 19th century aboveground tombs. Los Angeles National Cemetery (Los Angeles/West), occupying more than 100 acres. 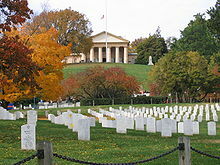 Cave Hill Cemetery (Louisville), Victorian-era National Cemetery occupying 300 acres. Woodlawn Cemetery (Bronx, New York City). National Historic Landmark covers more than 400 acres. Green-Wood Cemetery (Brooklyn, New York City). National Historic Landmark and Revolutionary War battleground covering nearly 500 acres. Babaoshan Revolutionary Cemetery in Beijing. Ereveld Leuwigajah in Cimahi, Dutch war cemetery. Mount of Olives, ancient famous cemetery in Jerusalem with ancient funerary monuments. Yarkon Cemetery in Petah Tikva, the new Pantheon of famous people. Trumpeldor Cemetery famous cemetery in Tel Aviv of famous people from the 19th century. Kiryat Shaul Cemetery in Tel Aviv. Yasukuni Shrine, Tokyo, controversial in part because it is where 6 Class A war criminals executed after World War II are buried. South Korea: Seoul National Cemetery in Seoul. Turkish State Cemetery in Ankara, with its monuments recalling the ancient Turkish structures of Central Asia, is where many major civilian and military figures of the republican era were interred, although notably Anıtkabir, the mausoleum of the founder of the republic, Kemal Atatürk, is a separate site. Karacaahmet Cemetery between Üsküdar and Kadıköy on the Asian Side of the Bosphorus in Istanbul, an expanse of 300 hectares (740 acres) of cypress woodland, is the largest Turkish cemetery and its foundation in the 14th century predates the Fall of Constantinople. A footpath from the banks of the Golden Horn in Istanbul cuts through the Eyüp Cemetery, an Ottoman-era burial ground where the tradition dictates that the marble headstones of men are topped by a turban while those of women have floral designs. A gondola lift line passes over part of the cemetery as well. The massive and highly elaborate tombstones at the Ahlat Cemetery (on the Lake Van near Tatvan), carved out of local volcanic rocks, date back to the local Ahlatshah Kingdom of the 11th–12th centuries and are typical of the medieval Turkish art. Gallipoli hosts several military cemeteries of soldiers from Turkey and the Commonwealth nations (Australia and New Zealand in particular) fallen during the Gallipoli Campaign of World War I.
Armenia: Noratus Cemetery, near Sevan on the lake of the same name, has the world's largest collection of khachkars—Armenia's massive, highly elaborately carved traditional headstones with a cross in the centre. Bulgaria: Central Sofia Cemetery in Sofia. Romania: Merry Cemetery in Săpânța, Maramureş; Ghencea Cemetery in Bucharest. Sweden: Woodland Cemetery (Skogskyrkogården, Stockholm/Söderort), a world heritage site. This travel topic about Cemeteries is an outline and needs more content. It has a template, but there is not enough information present. Please plunge forward and help it grow!